Improve your Back Health with Pilates! Did you know that your posture, back health, and how you move can actually be an indicator of how old your body is? So, if you have a healthy back you will not only feel younger but look younger too! What a great concept. Keep your spine healthy and you will be healthy! Your spine health should start with exercises that can help you improve the age of spine by doing back stretching and strengthening exercises that work the core or trunk of the body including all the major joints of the body. I haven’t found the fountain of youth but I think Pilates exercises are the closest you can get to anti-aging exercise. The beauty of Pilates is that it works all those deeper core muscles that contribute to a healthy back by strengthening the weak muscles and stretching the tight ones. In effect, Pilates corrects the length/tension imbalances in our bodies contributing to a more upright posture that looks and feels great. Get the recommended Pilates ebook here today to get started with your healthy back exercise plan to look and feel young again! Check out some of my favorite back exercises at home here. If you have Lower Back Pain or are looking for exercises to tone and strengthen the back then check out some of the great articles available to you here free! When you do Pilates exercises they not only make your back feel better but they give you more energy and a clearer more focused mind. Through the stretching and articulating movements of the spine. Pilates movements allow the fluid in the spine to flow more freely up and down the spine lubricating the joints and opening the flow of cerebral spinal fluid from the sacrum to the brain for clearer thinking and to energize your body. Pilates and Back Pain: Common injuries and how to avoid them. 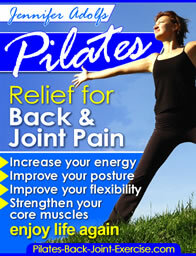 Back Pain Relief with Pilates! How to Heal a Pulled Back Muscle. Pilates Spine Exercises on the Spine Corrector. Leave back health and find out more about how Pilates exercises can benefit you. Are you searching for general Pilates articles or more info about the best back exercises for you? You may use this Google search box to help find specific phrases or topics. Be sure to check "Pilates-Back-Joint-Exercise.com" so you know you are getting the absolute best advice.